Hebrew is the only example of a language used by a people virtually expelled from their country who spread worldwide and was reborn on their return after 2,000 years. This happened because it never became a dead language. They did this in four ways. Firstly, it was the language of their religion - known as ‘biblical Hebrew’, which was taught and used. Secondly while they used the local language they spoke and wrote it using Hebrew script, for example Judeo-Arabic, Judeo-French and Judeo-Greek. Thirdly it was the language used between Jews as an international communication medium. Fourthly it became the common language for Jews escaping the pogroms and anti-Semitism at the end of the nineteenth century when they resettled in what was then Ottoman Palestine. Modern Hebrew evolved from the return of the Jews to what was Turkish Palestine in the 19th/20th centuries and evolved into the daily language of Israel. Ladino (Safardi) and Yiddish (Ashkenazi) tell how these languages developed. Over the three millennia of its existence, several languages have left an imprint on Hebrew. Indeed, the story of Hebrew is essentially the political/cultural story of the Jewish people as a whole, until today. According to A History of the Hebrew Language by Prof. Eduard Yechezkel Kutscher (the main resource for this article), a hypothesis in the language’s early development states that when the Israelite tribes conquered Canaan in the second half of the second millennium BCE and began settling amongst its inhabitants, namely the Canaanites who spoke a North-Semitic language, Hebrew arose through a mixture of this tongue and those spoken by other peoples who inhabited the region. For example, Akkadian, the languages of the Assyrians and Babylonians, greatly influenced the development and lexicon of Hebrew. Likewise, the Egyptian language left an imprint during that period of Israelite history. Later, when the Near East was ruled by the Persians and Greeks, their languages influenced Hebrew in the absorption of numerous foreign loanwords, many of which are still used today. In more recent history, Turkish Ottoman rule, followed by the British Mandate over Palestine, and the different waves of immigration from such far-flung places as Russia or the United States vastly influenced the vernacular of Modern Hebrew. One of the tasks of the Academy of the Hebrew Language is to weigh whether the inevitable foreign loanwords that enter the language should be replaced with new words with Hebrew roots, an endless job in today’s ever-evolving global village. Hebrew is the official language of the State of Israel. It is a Semitic language spoken by the Jewish people and is one of the world’s oldest living languages. There are 22 letters in the Hebrew alphabet and is read from right to left. 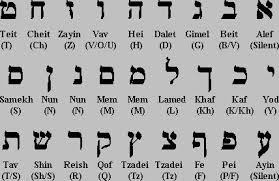 Originally the Hebrew language was not written with vowels to indicate how a word should be pronounced. However, around the 8th century a system of dots and dashes was developed whereby marks were placed beneath the Hebrew letters, for example .. Is ‘A’ . Today vowels are commonly used in Hebrew school and grammar books, but newspapers, magazines and books are largely written without vowels (Note: for example in English the word ‘read’ would be written as ‘rd’ but which can also mean ‘red’, ‘rid’ or ‘rod’ similarly ‘readers’ would be written as ‘rdrs’, as ’rd’ . Wrt sntnc wtht vwls.). Readers must be familiar with the words to pronounce them correctly and understand the text. Hebrew is an ancient Semitic language. The earliest Hebrew texts date from the second millennium B.C.E. and evidence suggests that the Israelite tribes who invaded Canaan spoke Hebrew. The language was likely to have been commonly spoken until the fall of Jerusalem in 587 B.C.E. Once Jews were exiled Hebrew began to disappear as a spoken language, though it was still preserved as a written language for Jewish prayers and holy texts. During the Second Temple Period Hebrew was most likely used only for liturgical purposes. Parts of the Hebrew Bible are written in Hebrew as is the Mishnah, which is Judaism’s written record of the Oral Torah. Since Hebrew was primarily used for sacred texts prior to its revival as a spoken language, it was often called “lashon ha-kodesh,” which means “the holy language” in Hebrew. Some believed that Hebrew was the language of the angels, while the ancient rabbis maintained that Hebrew was the language originally spoken by Adam and Eve in the Garden of Eden. Jewish folklore says that all of humanity spoke Hebrew until the Tower of Babel, when God created all the languages of the world in response to humanity’s attempt to build a tower that would reach the heavens. Until a century ago Hebrew was not a spoken language. Ashkenazi (Central, East European) Jewish communities generally spoke Yiddish (a combination of Hebrew and German), while Sephardic (from Spain) Jews spoke Ladino (a combination of Hebrew and Spanish). Jewish communities also spoke the native language of the country they were living in. Hebrew (and Aramaic) was used during prayer services. Ben-Yehuda had studied Hebrew while a Yeshiva student and was naturally talented with languages. When his family moved to Palestine they decided that only Hebrew would be spoken in their home – no small task, since Hebrew was an ancient language that lacked words for modern things like “coffee” or “newspaper.” Ben-Yehuda set about creating hundreds of new words using the roots of biblical Hebrew words as a starting point. Eventually he published a modern dictionary of the Hebrew language that became the basis of the Hebrew language today.He is often referred to as the father of Modern Hebrew. Today Israel is the official spoken language of the State of Israel. It is also common for Jews living outside Israel (in the Diaspora) to study Hebrew as part of their religious upbringing. Typically Jewish children will attend Hebrew School until they are old enough to have their Bar Mitzvah (when becoming 13 for a boy ) or Bat Mitzvah (when becoming 12 for a girl. Language revival began on October 13th 1881, as Eliezer Ben-Yehuda and his friends agreed to exclusively speak Hebrew in their conversations. As a result, the language, which had not been spoken as a mother tongue since the second century CE, once again became the national language of Israel. Some three thousand years earlier, when the Jewish people first arrived in Israel with Joshua, Hebrew was established as the national language and lasted for more than a millennium, until the Bar Kohba war in 135 CE. From that point on, Hebrew was exclusively used for literature and prayer, until late in the 19th century with the first aliya and Ben-Yehuda. Born in 1858, Ben-Yehuda grew up in Belarus, formerly part of the Russian Empire, where he started studying the Bible. At the age of three, he started learning in a cheder, a Yeshiva for young children, where he learned ancient Hebrew. By the time he was twelve, Ben-Yehuda was familiar with large portions of Torah, Mishna and Talmud. Hoping he would become a rabbi, his parents sent him to a Yeshiva where he continued studying Torah and ancient Hebrew. In the following years, he learned French, German, and Russian and traveled to Dunaburg, Latvia for further education. With the rise of Jewish nationalism in 19th century Europe, Ben-Yehuda was captivated by the innovative ideas of Zionism. While reading the Hebrew language newspaper HaShahar, he became acquainted with Zionism and concluded that the reviving the Hebrew language in the Land of Israel would unite all Jews worldwide. And so, in 1881, Ben-Yehuda made aliya and came to live in Jerusalem. At that time, it was believed that one of the criteria needed to define a nation worthy of national rights was its use of a common language spoken by both the society and the individual. In fact, Ben-Yehuda regarded Hebrew and Zionism as one and the same, writing that, "The Hebrew language can live only if we revive the nation and return it to the fatherland." According to researchers, it appears that in the fifty years preceding the start of the revival process, a version of spoken Hebrew already existed in the markets of Jerusalem. The Sephardic Jews who spoke Ladino or Arabic and the Ashkenazi Jews who spoke Yiddish needed a common language for commercial purposes, and the most obvious choice was Hebrew. It should be noted that it was not a native mother tongue as such, but more of a pidgin. As part of his vision of reviving Hebrew, Ben-Yehuda raised his son, Ben-Zion Ben-Yehuda (the first name meaning "son of Zion") speaking entirely in Hebrew. He refused to let his son be exposed to other languages during childhood. It is said he once reprimanded his wife for singing a Russian lullaby to the child. As a result, his son Ben-Zion became the first native speaker of Modern Hebrew. Ben-Yehuda was a major figure in the establishment of the Committee of the Hebrew Language (Va'ad HaLaschon), later the Academy of the Hebrew Language, an organization that still exists today. He wrote the first Modern Hebrew dictionary and became known as the "reviver" of the Hebrew language. However, while he worked tirelessly to raise awareness and fought its opponents, what finally brought about the revitalization of Hebrew were not Ben-Yehuda's activities in Jerusalem, but developments in the communities of the First Aliya (1881-1903) and the Second Aliya (1904-1914). The first Hebrew schools were established in these communities; Hebrew increasingly became a spoken language of daily affairs, and finally became a systematic and national language. Yet Ben Yehuda's fame and notoriety stems from his initiation and symbolic leadership of the Hebrew revival. In fact, Cecil Roth summed up Ben-Yehuda's contribution to the Hebrew language: "Before Ben-Yehuda, Jews could speak Hebrew; after him, they did." Ultimately, the process of Hebrew's return to regular usage was unique; there are no other examples of a sacred language becoming a national language with millions of first language speakers. In 1922, Ben-Yehuda died from tuberculosis at the age of 64.The house he built in the Talpiot neighborhood of Jerusalem was later transferred to the local municipality and is today a conference center and guesthouse run by the German organization Action Reconciliation Service for Peace, which organizes workshops, seminars and Hebrew language ulpan programs. The Hebrew language and its alphabet date back millennia in time. Four elements distinguish the Hebrew alphabet from others. First, Hebrew is written from right to left. Third, the names of the Hebrew letters have meaning in the Hebrew language. That doesn't actually matter when writing or reading, but it is nice to know. Lastly, there is a text universally accepted by Western and Eastern cultures. It is the Old Testament. The five books of Moses describe, in Hebrew, the creation of the world by God and the early history of the nation that evolved from the Hebrews into the Israelites and the Jews. The last two millennia BCE were turbulent years for alphabets as the two existing systems of writing – hieroglyphs and cuneiform – evolved into a third, representative form. Hieroglyphs and cuneiform used symbols (pictographs or schematic drawings) to depict words. That morphed into a phonetic system, where each sign represents a sound. Back then pictograms had no specific spatial orientation, nor did script have a definitive direction. But two main writing directions emerged towards the second half of the first millennium BCE. In one, possibly the earlier one, writing runs from right to left. If we assume that a right-handed scribe made those inscriptions in stone, he would be holding the chisel in his left hand, hitting it with the hammer in his right hand. His script would, logically, go right to left. One slight snag to that narrative: the various writing methods – chisel and hammer, stick on clay, stick dipped in ink on parchment - did not evolve linearly, neatly superseding one another, but were used simultaneously over eons. Ancient Greek script went right to left on one row, and then went left to right on the next - like an ox who leads a plow over a field. Finally it settled on left to right only some time in the first millennium BCE. If indeed it was due to change in writing materials, with parchment becoming the norm, why didn't Hebrew script follow suit? Maybe it was because the Hebrew script was used to write down holy words, chisel on stone, right to left, and those were not to be meddled with, whereas the Greek wasn't considered sacred. The descendents of the Canaanites, the Phoenicians, are generally credited with inventing the 22-letter alphabet letters, each representing a sound, at about 1300 BCE. They are also credited with the invention of money, so we do owe them much to this very day. The Phoenician trunk of the alphabetic tree then branched out into three distinctive alphabetic sets: Greek (about 1100 BCE), ancient Hebrew (about 900 BCE) and Aramaic (about the 8th century BCE). At this point we have to point out that the alphabet we call Hebrew today is, strictly speaking, not Hebrew at all. About the end of the sixth century BCE the Hebrew language discarded the ancient Hebrew letters and adopted Aramaic ones. This dramatic act is documented in the books of Ezra and Nehemiah in the Bible and commented on in the Talmud and in Greek sources. With the destruction of the First Temple in 586 BCE by Babylonian king Nebuchadnezzar, most Jewish inhabitants of Israel and Judea went into exile. Among them were the best and the brightest of the local intelligentsia. In their century of exile, Jews became involved in the intellectual and clerical life of Babylon. Even if they pined for Zion ("The rivers of Babylon," etc. ), they mastered the lingua franca of those days, Aramaic. Upon their return to Jerusalem, they found that life had gone on without them and those who had stayed behind continued life and religious ritual, based on the text of the Torah written in ancient Hebrew alphabet. Ezra, the priest returning from exile, had to reassert himself as the political and spiritual leader of the revitalized Jewish community in the land of Israel. He decided to rewrite the Torah in the Hebrew language, but using the Aramaic alphabet. As many scholars believe today that the books of the Old Testament as we know them were written, or at least edited, in that period, the Aramaic alphabet spelling out the Hebrew words of the Holy Writ are looked on by generations as being closest to the authorial source, whatever it may have been. It became the authoritative version. The ancient Hebrew alphabet version was left to the “commoners”, and it is used to this very day by the Samaritans. Meanwhile, religious services in the Temple and daily prayers were conducted in Hebrew, and scholars interpreting scriptures did it in Hebrew and Aramaic. Whatever language they spoke in everyday life, the Hebrew (that is Aramaic) alphabet had to be known to those who wanted to participate in the religious life of the community. Thus, although not all were speaking Hebrew anymore, the Hebrew alphabet had to be known to all. This practice of teaching the Hebrew alphabet for the sake of knowing the letters would continue through the almost two millenniums of the Jewish Diaspora. Scholars and intellectuals read and wrote Hebrew so that it was never quite as “dead”’ as the Zionist used to claim. The rest of the Jews just familiarized themselves with the letters, if not with the language. When Zionism warmed up to the idea of speaking Hebrew, the idea was wrapped into a heroic story of an ancient language resurrected from the dead. The truth was that even if Hebrew was not spoken by all, the alphabet – that written-backwards alphabet with odd looking letters, each representing a consonant, without vowels – was known to all Jews. Perhaps the alphabet that the Hebrew language uses today, which is in fact Aramaic, should really be called Jewish. There exists a widespread misconception about the languages that may be reckoned as “Jewish”. It is quite generally believed that there have been only two: Hebrew and Yiddish. Actually there have been been others, and the reasons are of considerable cultural and historic interest. It is true that Hebrew was the mother-tongue of the early Jews until the Destruction of the Temple of Solomon in 586 BCE. But when the exiles returned from the Captivity in Babylonia a hundred years later, they were faced with the fact that the vernacular in the land of Israel no longer was Hebrew but Aramaic. (The latter was then the common tongue throughout the entire Near East.) One of the reasons for this change was that the Babylonian con­querors had disrupted the normal flow of Jewish life by dis­couraging its ethnic cultural forms and by colonizing among the Jews, for calculated political reasons, large numbers of Aramaic-speaking non-Jews with whom many had proceeded to intermarry. But Aramaic must have had wide currency among the Jews even before then because it was the main language, both commercial and diplomatic, in all the coun­tries of the Near East and Mesopotamia. To be sure, Hebrew was still prized as the “sacred tongue” (lashon ha-kodesh), and while almost every Jew was familiar with it to some degree, it was used, from this time on, only for religious worship and for Torah-reading and study. There was even a Rabbinic prohibition introduced against the recitation of prayer in Aramaic. But despite this, a few prayers which had originally been composed in Ara­maic achieved such overwhelming popularity that they were incorporated in the Hebrew prayer book. These Aramaic prayers are the Kaddish (the prayer for the dead), Kol Nidre (“All the Vows,” chanted in the synagogue at the opening of the Yom Kippur service), and the Akdamut hymn (sung on Shavuot or Pentecost, the Feast of Weeks). In their complicated history over many centuries in dif­ferent parts of the world, the Jews evolved a special ap­proach to their adoption of foreign languages. During the Middle Ages, at a time when illiteracy was almost general among Christians (except for a small class of scholars and priests) in Europe, most Jews were literate. At the very least, the Jewish “man in the street” was able to read He­brew because the daily observances of his religion required that minimal language competence from him. In medieval Germany, where the Jews adopted German as their vernacular, they began to write it-but in the charac­ters of the Hebrew alphabet, which they already knew; they seemed to feel an antipathy for the “monkish” Latin letters. Then-after the ghettos were officially established by the papal bull issued by Innocent III in 1215-under the special requirements and conditions of Jewish ghetto-life, the orig­inal Old and Middle High German of the Jews, influenced by Hebrew phonetics and the incorporation of Hebrew words and idioms into ordinary speech, combined to evolve into a distinctive but different Germanic language—Yiddish—written in Hebrew characters. And as Yiddish spread from Germany into Poland, Russia, and other countries of Eastern Europe, it assimilated other language ingredients and added them to the German which formed its base. Some philologists have tentatively estimated that Yiddish, as it is spoken today, is comprised of about 70 per cent German, 20 per cent He­brew, and 10 per cent Polish, Russian, Romanian, Hungar­ian, etc. Judeo-Arabic too had a vogue in Mohammedan coun­tries (including those of Mesopotamia, Arabia, and North Africa, as well as Moorish Spain) as extensive as and for even a longer period of time than did Yiddish. Surprisingly enough, after the final Dispersion, in 70 c.e., as the centuries advanced, Arabic and not Aramaic became the spoken lan­guage of the majority of Jews. It was also the literary lan­guage in which many of the foremost Jewish scholars, phil­osophers, scientists, and poets composed their works, even though Hebrew re­mained the language of religious worship and Torah study. It should not be overlooked that, living in the midst of the world of Islam, some of the principal creators of Jewish cul­ture in the Middle Ages, such as Saadia Gaon, Solomon ibn Gabirol, and Maimonides, wrote their principal religious and philosophical works in Arabic and not in Hebrew, although used they used the characters of the Hebrew alphabet. A similar language pattern was followed by the Jews of Spain after their expulsion from that country in 1492. By the time they had found asylum in the Mohammedan countries of North Africa and in Turkey, Greece, and Bulgaria, they were already writing their native Spanish with Hebrew characters. This old-new Spanish language, in the course of time and because of accretions deriving from the cultural experiences of the refugees when they settled in various countries, became enriched with all kinds of foreign words and expressions: Turkish, Italian, Greek, Arabic - even Slavonic. The Castilian language of these Sefaradic Jews is called Ladino (or, sometimes, Spaniolish). In most respects, Ladino has not gone through such marked changes as, for instance Spanish, in its Latin-American environment since the Conquest. Judeo-Greek had long been spoken in Christian Byzantine in early medieval times. However, although today it is still written in Hebrew characters, it shows that it has absorbed only a very few Hebrew words and expressions. On the other hand, Judeo-Italian evolved into much more of a 'Jewish' language than Judeo-Greek. This was because each region of Italy had its own Italian dialect, or parlata. Consequently, during the Renaissance, Jews coming into one part from another found it easier to communicate with the Jews there than in their own vernacular: Judeo-Italian. It is an odd fact that, although most Italian Jews in other centuries could neither read nor write Italian in Latin characters, they nevertheless, were able to do so in Hebrew characters. They produced in Judeo-Italian translations of the Bible, prayer books and religious as well as secular poetry. There is even a Judeo-Persian language; it is spoken by the Jews in Iran, and different dialects of it are current among Jews in all of Central Asia. Many of the Jews of Bokhara in the Soviet Union still speak an ancient Tadjik dialect of the Persian Language-family into which, long ago, was incorporated a number of Hebrew and Aramaic words and idioms. The mountain Jews, who, according to their tradition, have lived in the Caucasus since Second Temple times, speak Farsi-Tat. This is a Persian dialect which they have enriched with Biblical Hebrew words and expressions. It is not without cultural interest that in their relatively obscure dialect they have been able to develop an inheteresting “Jewish” folk-literature. The Hebrews took the Phoenician consonantal system made a seemingly minor improvement. "Roughly 3,000 years ago, in and around the area we now call Israel, a group of people who may have called themselves ivri, and whom we call variously 'Hebrews,' 'Israelites,' or more colloquially but less accurately 'Jews,' began an experiment in writing that would change the world." That's how I began the remarkable history that links the Jewish people to its historic language and identity. (In the Beginning: A Short History of the Hebrew Language; NYU Press 2004). As Jews pause in the calendrical cycle to celebrate the Torah, it seems particularly apt to take note of the fascinating story that lies behind this experiment, without which writing would never have become widespread, and without which the world would have no Torah scrolls, books, newspapers or e-mail. The key is the vowels. Those of us who read and write take the technology for granted. It was an alphabetic experiment 3,000 years ago in Jerusalem that made widespread literacy possible. Before we look at what happened there, we need to understand the background. There are lots of ways to write words. Three systems that never made it predated the one that finally did. Humankind's first writing system was barely a system at all. Some 6,000 years ago, animal traders drew pictures of their animals with hash marks next to them to indicate quantity. So a tablet might represent "five sheep" with some indication of "5" next to a drawing of a sheep. This seemingly crude technique represented an enormous leap forward, because for the first time people could convey messages over a distance; before this, a merchant who wanted to tell his business partner to expect five sheep had to meet the partner face to face, or rely on a personal go-between. With this improved system, the merchant could send a remote message directly to its recipient. But his message options were severely limited. A second system greatly expanded the inventory of what could get written by introducing hundreds or thousands of "icons" and using them to create more complex messages. These icons were symbolic ways of representing a word with a picture. We still have icons. In modernity, the triangle-over-a-square that we use for "house" or "home" is such an icon. There are no houses that look like that, but we all know what it means. Similarly, even though the familiar heart shape (which we also use for "love") looks nothing like the four-chambered organ, its meaning is clear. The ancient systems of icons offered more complex messages than just "house," "heart" or "love." They even included abstract verbs and adjectives. But literacy was still limited to a professional class of readers and writers called scribes. The Sumerians, as early as the beginning of the 4th millennium BCE, created a third possible way of writing words. They recorded not the meanings of their words, but rather the sounds. The Sumerians devised a few hundred symbols, one for each syllable of their language, and used combinations of these symbols to represent words. This syllabic system was better than the iconic one, both because it was more flexible and because it involved fewer symbols. But literacy was still beyond the reach of the common person. Until the Hebrews, society's progress depended on scribes, for they were the only ones who could read and write. Indeed, a 4,000-year-old Egyptian document shows us the degree to which society valued these mediators of language. "There is no greater calling," it reads, "than to be a scribe." Of course, it was a scribe who wrote that, so we don't know for sure what the rest of society thought. With hindsight, though, we know the scribe was right. But precisely because only scribes could master these three systems - pictures, icons, and syllabic writing - each would eventually give way to a fourth: the alphabet. Sometime during the second millennium BCE, a language commonly called "proto-Canaanite" - that is, "the language that would become Canaanite" - began to be written entirely in consonants. Later, the Phoenicians of southern Lebanon would write similarly. This purely consonantal system cleverly needed only about two-dozen symbols in various combinations to record any word in the language. For example, the common ancient Canaanite word ram, meaning "high/exalted," would be written RM. The word for "god," el, was spelled ?L. (The question mark represents an alef, probably sounding like the glottal stop you hear between the "uh" and the "oh" of the modern "uh-oh.") The plural, gods, (elim) was written ?LM. Anyone could learn the system. Anyone could learn to write. The problem, however, was that without any vowels, many people couldn't read what they had written. The word RM could be read as ram, but also as rama ("height") or even roma ("Rome" - though Rome wouldn't come to be for centuries). So the consonantal system was a huge improvement, but was hard to read because some combinations of letters could be read in too many ways. In ancient Jerusalem, the vowel-letters were generally optional. (American President Andrew Jackson, who opined that, "it's a damn poor mind that can only think of one way to spell a word," would have been proud.) The word for "high" (ram) was still written RM, but if the Hebrews wanted to make it clear that they had the word rama in mind, they could append a heh in its newly invented role as vowel: RMH. And for roma, they could add a vav, too: RWMH. The system still wasn't perfect, but it was enough. Now, for the first time ever, the average person could learn to read and write. It seems that the average person was even expected to become literate. After all, we read in Deuteronomy (quoted daily in Jewish liturgy and to this day affixed in the entranceways to Jewish homes): "Write them on the doorposts of your house, and upon your gates." This presupposes the ability to write and, it would seem, to read. The Hebrews gave the world not only writing, but also the world's all-time best-selling book: the Bible. There is hardly a place on earth that has not been touched by it. But there would have been no way to spread and preserve the Bible without writing it down for the masses. And without the vowel letters, the masses would never have been able to read it. (We might contrast the ancient Phoenicians in this regard. While most of us learn about them, few have read any of their books.) In retrospect, we easily recognize the monumental influence of the alphabet, and the vowel letters that made it possible. But we are not the first generation to do so. The inhabitants of Jerusalem themselves seem to have appreciated the incredible power of their newly reinvigorated heh, yud, and vav. Genesis 17 tells of a covenant between God and a man, Abram, whose name is spelled ?BRM. (Again, the question mark represents an alef, used for a glottal stop.) The ancient word ?B means "father," and, as we saw, RM means "exalted." ?BRM was the "exalted father," or "tribal elder." When ?BRM enters into a covenant with his God, he gets a heh inserted in the middle of his name: ?BRM becomes ?BRHM. That is, Abram becomes Abraham. Regardless of the historical accuracy or divinity of the story - and here, obviously, well-meaning people disagree - it is clear to all that it is the special heh, one of three letters that completed the alphabet, that gets added to ?BRM to create ?BRHM. His wife, too, gets a heh added to her name: Sarai becomes Sarah. The Hebrews didn't stop there. As we saw above, the ancient Canaanite word for "god" was el, spelled ?L, and the word for "gods," therefore, was elim, spelled in Phoenician ?LM and in Hebrew ?LYM. The Hebrews took this common Canaanite word and added a heh right in the middle to create one of God's names: ?LHYM. In short, the patriarch, matriarch, and deity of the Hebrews all get their names by adding a heh to convert otherwise common words into special ones. The Hebrews used their vowel-letters not just to make writing possible, but to create their most important names. In addition to ?LHYM, we find a second, four-letter name for God, the tetragrammaton (which means "four-letters" in Greek). The four letters are yud, heh, vav, heh. Common pronunciations such as "Yahweh" or "Jehovah" miss the point. What really matters here is the remarkable fact that this name consists entirely of the Hebrews' newly invented vowel letters, each included once, with the particularly special heh repeated. The tetragrammaton is unique in ancient Hebrew, in that its pronunciation seems divorced from its spelling. It also seems to lack any plausible etymology, and is unattested in similar ancient languages. Now we know why. The Hebrews paid homage to the vowel letters that made it possible to spread the Word of God by using those letters to refer to God. The Hebrews modified the Phoenicians' system by using three letters both as consonants and as vowels. They thus gave the world the alphabet. Then they used one of their vowels to create the names of their progenitors and their God. They used a combination of all three letters to create what would become the most important way of writing God's name. The season to celebrate the Torah approaches. As Jews across the world use an ancient invention to revel in an ancient message, it seems fitting to acknowledge the gift that the ancient Hebrews bestowed on civilization. If you read the Torah, or even if you just read this essay, thank an ancient vowel. For centuries Hebrew was written only with consonants, the vowels being supplied by the reader. By the time of the Masoretes, however, the proper pronunciation of Hebrew was being lost because many Jews were no longer fluent in that language. Groups of Masoretes in Babylon and Israel invented signs to be placed around the consonants to indicate accents and proper pronunciation of vowels. At least three different systems were developed, but the one that proved most influential was that of the Masoretes in Tiberias, by the Sea of Galilee, the home of the Ben Asher family. Sources list five generations of Masoretes from this unique family, beginning with Asher the Elder of the eighth century C.E. The others were Nehemiah Ben Asher, Asher Ben Nehemiah, Moses Ben Asher, and, finally, Aaron Ben Moses Ben Asher of the tenth century C.E. * These men were in the vanguard of those perfecting the written symbols that would best express what they understood to be the proper pronunciation of the Hebrew Bible text. To develop these symbols, they had to determine the basis of the Hebrew grammatical system. No clear system of rules for Hebrew grammar had ever been recorded. Therefore, one might say that these Masoretes were among the first Hebrew grammarians. In his survey of the sociology of Jewish languages, Joshua Fishman wrote: "English or some Jewish variant thereof is probably the most widespread Jewish Language of our time" (Fishman 1985:15). Today, in the U.S., Canada, Great Britain, South Africa, and Australia, hundreds of thousands of Jews speak Jewish varieties of English, with influences from Yiddish, textual Hebrew, and Modern Hebrew. There is a great deal of variation according to region, generation, religiosity, and gender, but all varieties of English spoken by Jews can be discussed together under the umbrella of "Jewish English" (Gold 1985, Steinmetz 1987). The difference between general English and Jewish English can be as small as the addition of just a few Hebrew or Yiddish words (e.g., Hannukah, matzah ball, shlep), or it can be as large as multiple influences from Yiddish in syntax, lexicon, and phonology. The former is common among Jews with little or no religious practice, and the latter is used today mainly by Orthodox Jews (and in the past by Yiddish-speaking immigrants and their children, referred to as "Yinglish"). Orthodox Jewish English includes hundreds of loan words from Hebrew and Yiddish, including baruch hashem 'blessed is God', blech 'metal stove covering that facilitates cooking on the Sabbath', bentsh 'bless, say Grace After Meals', dafka 'specifically, really, to make a point of', and kippah 'skullcap'. Some loan words are semantically specialized: leyn ('read Torah' < Yid. 'read'), as are some English words: "learn" ('learn Jewish texts'). Other features of Orthodox Jewish English include quasi-chanting intonation contours, loan uses from Yiddish ("I'm eating by her"; "He doesn't know from that"), frequent word-final /t/-release ("night" rather than "nigh'"), and Yiddish-influenced periphrastic constructions ("I'm not mekabel that" ('I don't accept that'); "We do all that shtik to be mesameach the chatan v'kala" ('We do all those routines to entertain the groom and bride. ')); "Before I knew that he had said it in shiur, I was mechaven to the Rosh Yeshiva's pshat in the Gemara" ('Before I knew that he had said it in class, I found myself agreeing with the head-of-the-school's interpretation in the Talmud') (Weiser 1995:59)). For more on American Jewish English lexicon, see Gold 1985, Steinmetz 1987, and Weiser 1995. For other features, see Benor 2000, 2001. For discussion of Australian Jewish English, see Clyne et al. 2001. Our young men have discovered a new way to verbalize. And a dash of Aramaic – a linguistic potpourri! Take ('really'), epis ('something'), grade ('in reality'), a gevaldike zax ('remarkable thing'). It's the tawk of the town, mamish ('really') tog un naxt ('day and night'). Joshua Fishman asks: "Is it possible that a Jewish Language is being born before our very eyes but that few are aware of it?" (Fishman 1985:15). Yes, it is. And in order to understand more about the development of Jewish languages, now is the time to research Jewish English. The rejection of the Diaspora and the "shtetl" world of their parents made the Ashkenazi revivers of the language choose what they thought was the "Sephardi" dialect for the new, spoken Hebrew. That was such a radical social and ideological decision that it needs further clarification. In English and other languages, speech patterns have changed in the course of history, and only much later did the spelling stabilize; in Hebrew, the opposite was true: the sanctified spelling of the Bible was preserved in its minutest details throughout the ages, but different dialects, developed by Jews in distant lands and under very different foreign influences, gave rise to several different pronunciations of the same spellings. Ashkenazi Hebrew pronunciation was formed in Central and Eastern Europe some time after the thirteenth century, then branched out into several dialects and survived in Orthodox communities until the present. This was the Hebrew language that had brought the Zionist immigrants to Eretz-Israel. Once here, they threw out even the Hebrew of their childhood, repressed whatever their memories could express in it, and chose a fundamentally different, foreign accent. BenYehuda and the first Hebrew speakers in Jerusalem had compelling social reasons: the established JeWish community in Jerusalem was Sephardi, it carried the respect of the glorious Spanish Jewry, and the title "Pure Sephardi" (Sjaradi tahor) had an aristocratic ring to it. A similar connotation carried over to the language, as is indicated by the name of the society, saja brura, meaning "clear," "precise," or select language. Hebrew was not used in the daily affairs of the Sephardi community, except for precise reading of holy texts, hence the vowels were not changed and the words not contracted, as in the living language, Yiddish. Thus the Sephardi pronunciation sounded more prestigious than that of the Ashkenazi Orthodox Jews of the "Old Yishuv" in Jerusalem (who excommunicated BenYehuda twice). It was also part of his romantic attraction for things Oriental. There were also "scientific" justifications for the choice of the Sephardi pronun­ciation. For example, the blurring of the distinction between the Biblical vowels patah and kamatz (and reading both as a) can be found in the Septuagint (the Greek translation of the Bible) and hence in European transcriptions of Biblical names (e.g., David rather than the Ashkenazi Dovid). The Biblical distinction between milra and mil'eyl (the place of stress on the ultimate and the penultimate syllable, respectively) was known to the Hebrew grammarians of the Vilna Enlightenment, Ben-Ze'ev and Adam Ha-Cohen Levinson (following the tradition of Hebrew and Christian medieval grammarians). This distinction favored the ultimate stress on most words, as performed in the "Sephardi" accent of the Near East. More important, it is indicated in the accent marks of the Bible, and a fundamentalist return had to consider it. But Biblical fundamentalism could also have claimed that the precise distinction of vowels in the Bible was better preserved by Ashkenazi and not by Sephardi Hebrew and that it was the Ashkenazim and the Yemenites who maintained the distinction between patah (a) and kamats (0) and between the hard tav (t) and the soft tav (S). 62, Indeed. the Nobel Prize-winning Hebrew novelist Agnon, who never fully learned to speak in the Sephardi accent, regretted that the Yemenite pronunciation was not accepted; he apparently did not dare to mention the Ashkenazi. When the immigrants of the Second Aliya arrived in Eretz-Israel, the so-called "Sephardi" pronunciation was already a fait accompli; the rural school in the agricultural settlements introduced the study of Hebrew and instruction of other disciplines in Hebrew, and the authority of the sages of Jerusalem was decisive for the few Hebrew teachers, But this was a grammar school that did not teach literature and did not even suspect that a great Hebrew poetry in the Ashkenazi dialect had emerged in Europe at that same time and had, indeed, influenced a new wave of Zionist immigrants. Parents vehemently opposed the Sephardi dialect, strange to their ears, their prayers, and their understanding of Hebrew, but the few nationalist Hebrew teachers felt superior and imposed their will in the schools. The Teachers' Assembly in 1903, organized and influenced by Menakhem Usishkin (an activist characterized by his virulent hatred of Yiddish), who arrived specially from Odessa, decided on the Sephardi pronunciation for the new language. The teachers' orga­nization was the major vehicle for teaching the young generation Hebrew and played a decisive role in implementing the accent. But they compromised too: the handwriting they selected was Ashkenazil-Unlike speech that had to be invented, handwriting was inherited for generations, and that was, apparently, too hard to change, even for devoted teachers. But, outside of this historical accident, there were strong social and ideological motivations in favor of the "Sephardi" dialect. For one, accepting the "Sephardi" dialect was eventually important for the melting pot of Jewish tribes in Israel; it was designed to bring the Sephardi Jews closer to the new Ashkenazi establishment, and the other tribes would follow suit. The Jerusalem propagators of the language, Ben-Yehuda and David Yelin (who intermarried with a Sephardi family), had the socialization with Sephardim in mind; and they did influence the teachers and the normative Language Committee, But this argument was irrelevant at the time of the formation of a Hebrew-speaking society in the lowland of Palestine, The labor movement and the settlers of Tel Aviv were absorbed in their own Russian-derived, intenSively pursued, and "superior" world of ideas; they did not even see the Yemenites with their distinct accent and paid little attention to the Galitsyaner S. Y. Agnon (until their own Brener discovered him). WHAT IS THE LADINO LANGUAGE? During the Middle Ages, Jews were instrumental in the development of Castilian into a prestige language. Erudite Jews translated Arabic and Hebrew works – often translated earlier from Greek – into Castilian and Christians translated again into Latin for transmission to Europe. Until recent times, the language was widely spoken throughout the Balkans, Turkey, the Middle East, and North Africa, having been brought there by Jewish refugees fleeing the area today known as Spain following the expulsion of the Jews in 1492. The contact among Jews of different regions and languages, including Catalan, Leonese and Portuguese developed a unified dialect differing in some aspects from the Castilian norm that was forming simultaneously in the area known today as Spain, though some of this mixing may have occurred in exile rather than in the peninsula itself. The language was known as Yahudice (Jewish language) in the Ottoman Empire. In late 18th century, Enderunlu Fazıl (Fazyl bin Tahir Enderuni) wrote: "Castilians speak the Jewish language but they are not Jews." Ladino’s grammatical structure is close to that of Spanish, with the addition of many terms from Hebrew, Portuguese, French, Turkish, Greek, Bulgarian, Bosnian and Serbo-Croatian depending on the geographic origin of the speaker. Like many other Jewish languages, Judaeo-Spanish is in danger of language extinction. Most native speakers are elderly, many of them having emigrated to Israel where the language was not transmitted to their children. Two recently posted articles in the Jewish Internet magazine Tablet provide an excellent introduction to anyone interested in the fascinating and problem-fraught field of Yiddish historical linguistics. One, by Cherie Woodworth, a scholar of Eastern European history who died last year, at the sadly young age of 46, first appeared in the journal Kritika in 2010. The other is by Tablet staff writer Batya Ungar-Sargon. The two are complementary and should be read together. The questions of where and when Yiddish originated, who were its first speakers and how it spread were long thought by most Jewish historians and Yiddish linguists to be open-and-shut. The standard view was most forcefully presented by the great Yiddish linguist Max Weinreich (1894-1969), who developed it exhaustively in his four-volume “Geshikhte fun der Yidisher Shprakh” (“History of the Yiddish Language”). Briefly summarized, it held that Yiddish first emerged as a distinct language around the year 1,000, when Jews migrating from northern and eastern France settled in the Rhineland of western Germany. These Jews (whose ancestors had come, via southern France, from Spain and Italy) spoke a French that had many Hebrew and Aramaic words culled from Jewish texts and traditions. And when, adjusting to their new environment, they switched to speaking German, they retained these lexical items, in addition to a smattering of words and names deriving from French, Spanish and Italian. This new Judeo-German, the standard view goes, kept accruing more Hebrew and Aramaic vocabulary as Jewish learning continued to influence it; developed certain grammatical and syntactical idiosyncrasies as a result of the self-contained nature of Jewish life, and split into two main dialects: the “Western Yiddish” of Germany, Holland and Switzerland, and the “Eastern Yiddish” of Jews who pushed into the Slavic-speaking areas of Poland, Belarus and Ukraine. Now incorporating many Slavic words, too, Eastern Yiddish gradually became a distinct language. This is the language most of us know simply as “Yiddish,” Western Yiddish having almost entirely disappeared by the end of the 19th century as social barriers between Jews and gentiles fell in the countries in which it was spoken. As accurately described by Woodworth, Weinreich’s view of Yiddish’s history is a gradualistic one, based on the assumption of slow and steady Jewish migration, over a period of many hundreds of years, from the south of Europe to its north, and from west to east. In part because it seems so natural an explanation, and in part because of Weinreich’s enormous authority, it went unchallenged during his lifetime. When they finally came, however, the challenges were serious ones. Basically, they can be broken down into three categories: linguistic, demographic and genetic. Linguistically, an analysis of German dialects shows that a number of salient features in Yiddish have little in common with the speech of the Rhineland and much more with the German of other regions, such as Bavaria and Austria. To take a good example cited by neither Woodworth nor Ungar-Sargon, the ubiquitous Yiddish diminutive “l” -ending in words like meydl, a girl (from moyd, maid or young woman); yingl, a boy (from yung, a youth), and bisl, a little bit (from bis, a bite), characterizes Bavarian-Austrian dialects but not those of western Germany, where we find Mädchen, Jungchen and bisschen. It is hard to square things like this with the standard, Weinreichian view. The demographic challenge is equally weighty. In the first place, we now know that in the year 1,000 or thereabouts, there were already Slavic-speaking Jewish communities in Eastern Europe that did not, apparently, come from Germany; why should they have been “Yiddishized” when German Jews began arriving among them? And second, if one wishes to argue that Yiddishization took place because Jewish migrants from Germany numerically swamped these Slavic speakers, studies indicate that the Jewish population of Germany in the 11th and 12th centuries was probably no more than 50,000, most of which would have remained where it was. The Jewish population of Eastern Europe in 1900, on the other hand, was close to 10 million. Allowing even for the relatively large families that Jews may have had, there seems no way to account for this on the basis of an eastward migration of German Jews, plus high birth rates and low infant mortality rates, alone. Finally, and most recently, there are the DNA findings. Although difficult to interpret, they appear to indicate that a number of Eastern European Jews are genetically closer to populations in Central Asia, the Caucasus and Iran than to the Jews of Western Europe. This has led to a revival of the “Khazar theory,” the belief that part or much of Eastern European Jewry originally came not from points west, but rather from the Turkic tribes that inhabited the shadowy kingdom of Khazaria, the medieval state between the Black and the Caspian seas whose rulers, along with some of their subjects, were said to have converted to Judaism. When Khazaria was destroyed by its enemies in the 10th century, the theory goes, many of its Jews fled westward, multiplying by many times the numbers of Jews in Poland, western Russia and the Baltic states. And yet, why, if this happened, is there absolutely no historical evidence of it? And why should a Turkic-speaking Jewish majority have become Yiddishized any more than a Slavic-speaking one? The miracle of its rejuvenation today is credited to the work of journalist/scholar Eliezer Ben-Yehuda, often called the Father of Modern Hebrew. His work from the 1880s onwards was monumentally important for the language’s dissemination and advancement in the Yishuv settlement in the Land of Israel. The Academy of the Hebrew Language (Hebrew: הָאָקָדֶמְיָה לַלָּשׁוֹן הָעִבְרִית‎, Ha-Akademya la-Lashon ha-Ivrit) was established by the Israeli government in 1953 as the "supreme institution for scholarship on the Hebrew language in the Hebrew University of Jerusalem of Givat Ram campus." It is an educational institution with the mission of creating new Hebrew words to ensure that the language does not die out. The Academy's mission, as defined in its constitution, is "to direct the development of Hebrew in light of its nature" (לכוון את דרכי התפתחותה של הלשון העברית לפי בעה). The Academy sets standards for modern Hebrew grammar, orthography, transliteration, and punctuation based on the historical development of the language. It also writes a Hebrew Historical Dictionary. The plenum consists of 23 members. In addition, the academy employs 15 academic advisors, among them respected scholars of language, linguistics, Judaic studies, and Bible. The Academy’s decisions are binding on all governmental agencies, including the Israel Broadcasting Authority. This map represents the diversity of Jewish languages around the world and throughout history. If you hold your mouse over a shaded area, you will see what language was spoken there at some point in the past or present. Click on it for more information. The areas shaded for each language are only approximate. Some areas have been home to several Jewish languages (e.g., Judeo-Berber, Hakitía, Judeo-Arabic, and Jewish French in Morocco; Judeo-Slavic, Yiddish, and Jewish Russian in some Slavic lands). In order to represent all periods of history in one map, each area includes only one language and does not present information on variation, chronology, bilingualism, etc. This list of languages is by no means comprehensive. Several other languages have been documented to some extent. and articles in the Jewish Language Review (published in Haifa 1981-1987). This map was conceived by Sarah Bunin Benor, designed by Leah Helfgott, and edited based on the suggestions of several Jewish language experts.